MOUNT VERNON, Ohio (CBS/WBNS/AP) Two women and an 11-year-old boy were stabbed to death and dismembered before their bodies were stuffed in garbage bags and lowered into a hollow tree, an Ohio coroner said Saturday. Preliminary autopsy reports indicate that Tina Herrman, her son, Kody Maynard, and her friend Stephanie Sprang were stabbed several times with a knife in the back and chest Nov. 10, according to Knox County Coroner Jennifer Ogle. "They were then placed inside large plastic garbage bags and later lowered into the hollow of a large tree," Ogle said in a statement. The coroner said that there were no signs of sexual assault and authorities were still working to determine the exact location of each person's death, according to CBS affiliate WBNS. A final report was expected to be completed in 6-8 weeks. The remains of the family's dog, a miniature pinscher named Tanner, were also found in the tree with the bodies, said family friend Joe Pejsa. Authorities discovered the bodies Thursday, four days after investigators found Sarah Maynard, the mother's 13-year-old daughter, bound and gagged, but alive, in the basement of an unemployed tree-cutter, Matthew Hoffman. Hoffman, 30, has not been charged with murder, but is being held on $1 million bond, accused of kidnapping Maynard and keeping her in the basement of his home, about a 15-mile drive from the wildlife area where the bodies were found. 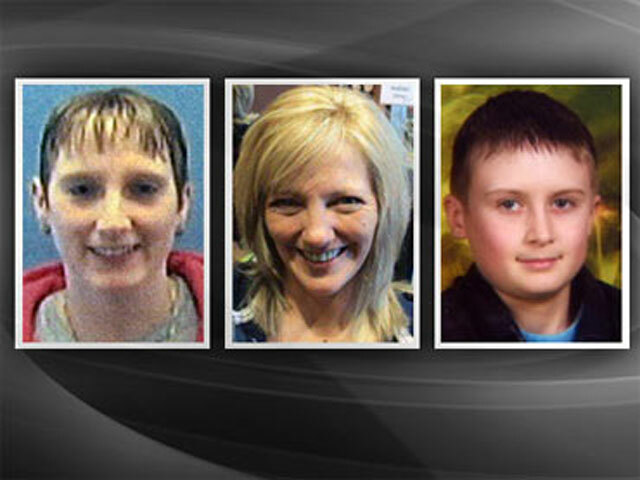 Authorities said Hoffman gave them information that helped investigators locate the bodies. He is the only suspect in the killings. Investigators are unsure why the four were targeted and have yet to find a motive in the killings, but the sheriff has suggested that Hoffman, who spent six years in a Colorado prison for arson and other charges, had been watching them for some time. The deaths have left the small central Ohio community in a state of shock. Hundreds attended a vigil Thursday night to pay their respects to the victims and their families. "Our entire community has been wounded in this tragedy and words can't describe the sorrow felt by all...," Ogle said, according to CNN. The 60-foot-tall American beech tree where the bodies were found was cut down Friday out of respect for the victims' families.